Because we deliver at home, some things go a bit differently than when you deliver in the hospital. For example, the PKU test. Our midwife brings the forms to our house, does the heel prick, and then we send the results in to the MDH (MN Department of Health) and they do the actual testing. When this testing is done, they save not only the results, but also the blood samples for other testing/research. You do have the option of having these things destroyed. I was planning on doing this. However, as I was looking at the form you fill out to have the samples and results destroyed I got more and more annoyed! First of all, they make you feel like a criminal for even making the request... "I understand that the risks involved in destroying my child's newborn screening blood sample will result in loss of the blood sample for medical or identification purposes." Yup... that's kind of the point, isn't it?? Then, there is the actual request. You check the boxes for what you wish to have done. Your choices are "I request my child's newborn screening blood sample be destroyed immediately or within twenty-four months of test, whichever is later." and "I request my child's newborn blood screening test results stored at the Minnesota Department of Health's Newborn Screening Program be destroyed immediately of within twenty four months of testing, whichever is later." Gee... I wonder which is later?? And, what are they doing with the samples in that 24 month period before they are destroyed?? Kind of makes the whole request useless I'm thinking. To top it all off, if you want to request that the samples/results be destroyed you much have the form notarized. Seriously?? Either that, or we have to provide a copy of the birth certificate and photo ID to Public Health or medical personnel. This person must then sign the form as a witness. Thanks for letting me rant a bit. Jericho is doing great, and finally starting to sleep better at night. I am actually feeling pretty rested. This week will be the first week I'll have all the kids home with no adult help around, so I would covet your prayers as we make a true test of the "new normal" here in our home. Also, if you could pray specifically for me that my depression issues would not mushroom. Many of you know that I am on meds to treat my depression (have been for several years). I try to keep the dosages at a minimum, and so far, things are going well. However, the postpartum period (first year after baby arrives) can be a difficult one for anyone, and the past would indicate that around 3-6 months postpartum is the worst for me. I would love to keep my meds at the low dose I'm taking now, and would appreciate prayer that this would be a smooth year for me. Not me! You don't get to have that info. LOL But, my sweet baby has been getting some good milk! Joy came and weighed her today and she has gained a full pound! So, at 11 days she is now 8lb. 14oz. 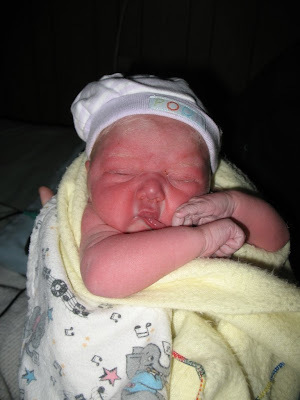 Jericho Faith was born at 9:30am on January 13, 2009. We praise God for our newest addition. Everyone is adjusting well, and the kids love on her every chance they get. Pray as we continue to make new routines and make necessary changes in our home/family. Arrived at 9:30 am on January 13. 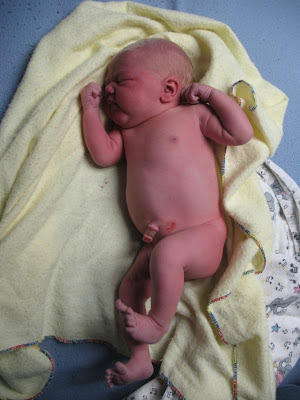 We don't have a weight yet as the midwife went to attend another delivery. Most of us present are guessing less than 9 lbs. All the kids watched the delivery and are totally in love with Jericho. I refuse to wear maternity clothes today. Good thing I have a nice pair of *stretch* jeans that I love. I've paired that with a cute nursing top from Motherhood. If I'm really careful it still covers my belly. LOL Don't worry... it's cold and snowy today, so I'll be wearing a sweatshirt over top. She's overdue... take a guess at when she'll finally show up! Alex and Chase were both born 5 days after their due dates. The rest were all early (granted two of them were only "early" by one day). So, this is the longest I've been pregnant since 9 years ago!! Crazy. I can honestly say that every day I've wanted it to be the day Jericho makes her entrance. But, even in my desire, I still had a date in my head. Today. Specifically, January 1st. I realized when I woke up this morning that as much as I've been bummed at the end of each day as I still carry Jericho within my womb, if today ends that same way the disappointment will be greater. And yet, I know Who holds the future. He has a plan, and He already knows the day. Related to birth, Steph sent me a link to another blog we keep tabs on. Ann, at Holy Experience, shared these thoughts near Mother's Day. I also had the privilege of birthing a child on the Saturday before Mother's Day. It will be 11 years this coming May. And while my experience was different from Ann's (the emotions that went along with having my first child) this post helped me remember the joy of becoming/being a mother. So, for today I will cherish the children I have here. I will pray for Jericho and her upcoming delivery. I will enjoy motherhood.